Croatia is a country in southeastern Europe, on the Balkan Peninsula. Formerly one of the six republics of Yugoslavia, Croatia declared its independence in 1991. Zagreb is the capital and largest city. Croatia has a long coastline on the Adriatic Sea. More than 1,000 small islands fringe the coast and form part of Croatia’s territory. The scenic beauty of the Adriatic coast and the country’s rich cultural traditions attract millions of tourists every year. In addition to tourism, the Croatian economy is balanced between industry, manufacturing, and agriculture. The country is rich in mineral resources, including petroleum, coal, and natural gas. The people of Croatia are mainly ethnic Croats. Until 1991 about 10 percent of the population was ethnic Serbs, along with a much smaller percentage of Hungarians and Italians. In mid-1991 fighting broke out between the Croats and Serbs, with the Croatian government backing the Croats and federal Yugoslav military forces supporting the Serbs. Thousands of people died and much of the country was heavily damaged. At one point the Serbs controlled a third of Croatia’s territory, but by mid-1995 the Croats had retaken these areas and expelled most of the Serbs from the country. A peace accord reached in late 1995 ended the war. Since then, Croatia has worked to rebuild its economy and infrastructure. 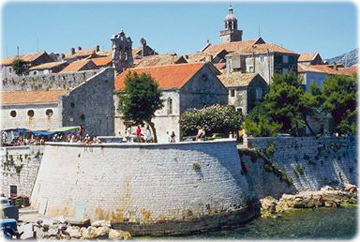 Korcula village on island, Adriatic Sea.